If you have a problem, if no one else can help, and if you can find them, maybe you can hire... The A-Team. Wait that can't be right, let me start this review off again - If you have a problem, if no one else can help, and if you can find them, maybe you can hire The A-Team, however, if they happen to be engaged, maybe you can call this new band of disgraced special ops soldiers, The Losers. Based on the comic book series, of the same name, from DC/Darkhorse Comics, Clay (Jeffery Dean Morgan), Jensen (Chris Evans), Roque (Idris Elba), Pooch (Columbus Short) and Cougar (Óscar Jaenada) are members of an elite United States special ops team sent into the Bolivian jungle on a search and destroy mission. However in true action movie fashion it doesn't, quite, go to plan and the team are framed for a crime they didn't commit - sounding familiar at all? Determined to clear their name and seek revenge on the mysterious criminal known simply as Max, the team join up with Aisha (Zoe Saldana) for a less than sophisticated mix of explosions, violence, bone idle heroism and quirky gadgets. A-Team comparisons aside I enjoyed The Losers for what it was; big, loud, stupid and catered nicely to my, often exaggerated, manly side. The cast were in similarly fine form, with very little to choose between them. Their frantic and comedic nature in particularly tense situations was as much fun as the earlier Lethal Weapon films while their distinctly different personalities complimented each other brilliantly. Regrettably it does suffer from more than a few pitfalls, such as the underwhelming quality of the CGI. The lead antagonist, Max (Jason Patric) just wasn't sinister enough or have any real connection to The Losers to make for a genuinely emotional encounter. You got the impression at times The Loser's own worst enemy was in fact themselves, and Max's typically corrupt, capitalist, government official was just a vehicle to channel the film's focus than the opportunity to display an interesting villain. 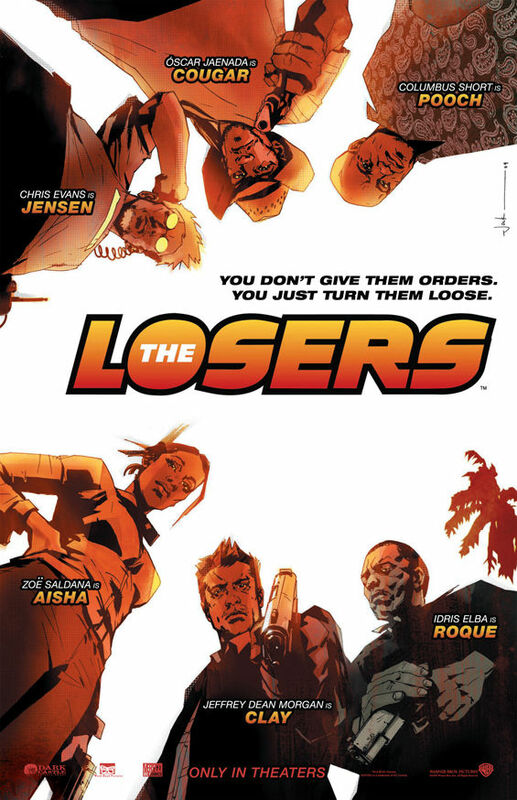 One of the most unfortunate aspects of The Losers' is the director, Sylvain White, placing most of the best moments within the trailer and not leaving much else to the imagination. That said I enjoyed the trailer, therefore an extended version of it is hardly an awful thing by any means, just disappointing. Despite the highly stylised action, a nifty comic book introduction and mostly witty dialogue there was very little to offer the audience they haven't seen in a dozen Arnold Schwarzenegger films past. It won't win any awards for originality, and could well suffer from being released in the same year as the A-Team and the highly anticipated 80s romp, The Expendables. However The film is a fun way to kill a couple of hours in the cinema, with a wonderful ensemble of high quality actors. They may be Losers, but I can't fault them for effort. The Losers is out in cinemas everywhere now. Haven't seen The Losers yet and will probably give it a miss. I'll probably wait to see The A-Team, although my expectations aren't too high for that one either!